Fungal Infection—a very bad odor coming from your shoes is often a by-product of bacteria or fungi meeting up with sweat in your shoes. Athlete’s foot and fungal toenails can result from these invaders in your shoes. It’s important to not wear the same pair of shoes on consecutive days. Give shoes a chance to air out between wearings. Wearing the wrong size—there are many people who are currently wearing shoes that are the wrong size for them. As we age, it’s natural for feet to grow in size. You may not want to give up the size 7’s you wore in your 20’s but if now you are a size 8 or 9, you are encouraging the development of ingrown toenails, bunions, and other toe deformities. We suggest that all our patients get their feet professionally measured. You may find that one of your feet is larger than the other. This is not unusual and you should buy shoes to accommodate the larger foot. Lazy footwear habits—broken shoe backs, stretched out slip ons and flip flops all point to a patient that is impatient about getting shoes on and off. What you save in time now you may very easily lose being laid up with chronic foot pain later. 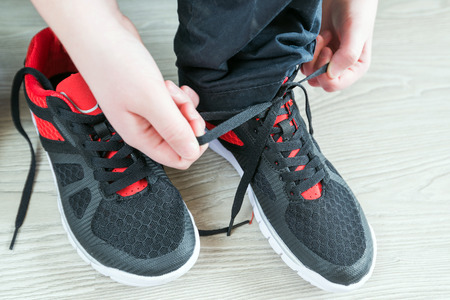 Lace up shoes are best for providing support and stability for your feet. Potential threats for diabetic patients—because many patients with diabetes also experience neuropathy (a condition associated with diabetes that decreases sensation in the feet), irritants in the shoes may not be immediately apparent. Loose stitching, a small pebble or other foreign object in the shoe can cause a blister or cut in the skin that for a patient with diabetes can quickly become a major medical threat. Checking the inside of the shoe is very important for these patients. Mechanical or structural foot issues—unusual wear patterns in a shoe, such as overly worn heels or shoes that slant toward the inside or outside of the shoe, may indicate a biomechanical problem about your feet. If you examine your own shoes and find any of these conditions, or you have other questions about what your shoes are saying about the health of your feet, contact our Houston, Pasadena or Sugar Land office for an appointment.